Comice is the french word for Pear. I don’t believe that this is a new distro, just Pear renamed into Comice. 🙂 Pear OS is a Mac OS X looking Ubuntu-based operating system introduced last year. Currently Comice OS 4 is distributed only as a 64-bit ISO image burnable on a DVD media or USB flash drive. Comice OS is a beautiful, useful & simple Linux distribution. 😉 Comice OS 4 comes with Gnome 3 Interface. 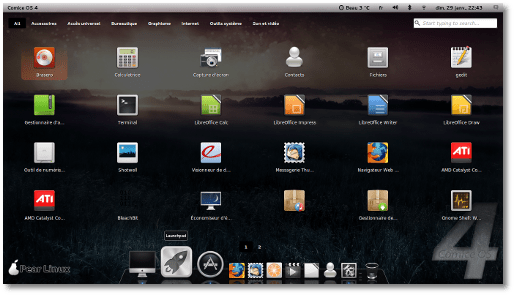 Comice GNOME Shell is modified to look exactly like a Mac OS X desktop. Is this Comice really worth the try? If it is, then I will. There are more than 300 flavors of Linux 🙂 Worth trying something different other than Windows. At the moment, Comice OS 4 is distributed only as a 64-bit ISO image burnable on a DVD media or USB flash drive. Providing us this kind of information is really a big help. I will definitely check this after i post my comment. And i will surely recommend this to all of my friend. Looking forward on you next post. Thanks!